Saint Isidore is one of the most popular saints among the common people. Born into a poor family near Madrid, Isidore was an uneducated farmer, who worked on the estate of John de Vergas for his entire life. Isidore rose early in the morning to go to Mass every morning and spent many a holiday devoutly visiting the churches of Madrid and surrounding areas. All day long, as he walked behind the plow, he communed with God. His devotion apparently became a problem, for his fellow workers sometimes complained that he often showed up late because of lingering in church too long. Late, though he was, his plowing was nevertheless accomplished by angels that resulted in three times more productivity. The miracle of the multiplication of food occurred when Isidore fed a flock of starving birds and on another time when Isidore shared his food with a large group of beggars. 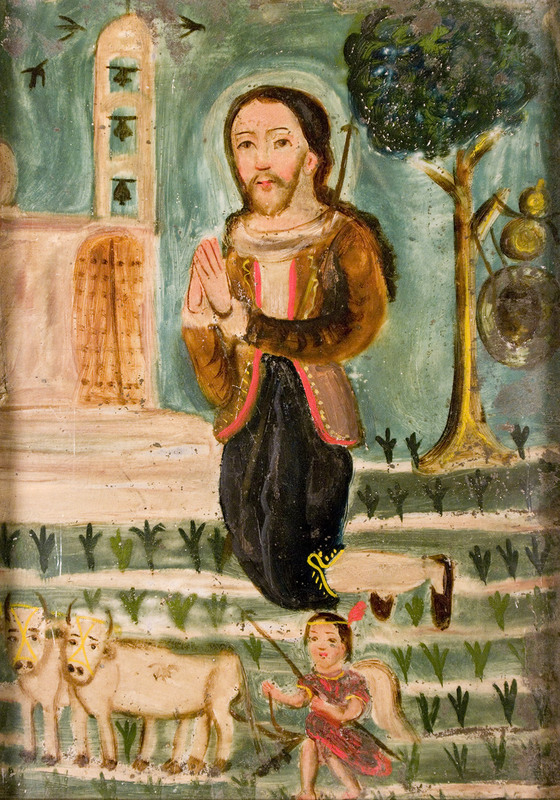 In retablos, Saint Isidore is always shown as the largest figure, kneeling in prayer, wearing his Castilian outfit in the center of the piece. Nearby one will see his hat and water gourd. In the lower third of the image the angel has yoked the cattle and is plowing the field. To the right of Saint Isidore is the cathedral with black birds flying about. Saint Isidore is the patron saint of farmers, peasants, day laborers, the city of Madrid and the National Rural Conference in the United States.